An attorney I recently met, asked a group of people to answer a simple question: What will happen to your assets if you die without a Last Will & Testament? The most common responses were “all of my assets will pass to my spouse” or “all of my assets will pass to my children”. A few people believed that their assets would go to the State, particularly in cases where the person answering the question had neither a spouse nor children. The most surprising thing about this exercise was that of people questioned, only 15% were correct! So, what happens to your assets if you don’t have a Will? The correct answer is that it depends on two factors. First, are your assets “probate” or non-probate” assets? Second, who are your surviving family members? Any asset which you own at the time of your death that is not classified as a non-probate asset is a probate asset. Probate assets pass to the beneficiaries named in your will or, in the event that you do not have a will, to your surviving family members pursuant to state intestacy law. 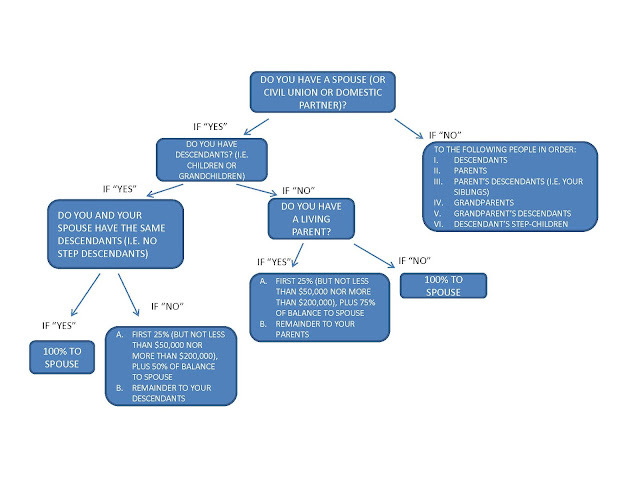 The chart below outlines the New Jersey intestacy law and will aid you in determining where your probate assets will go in the event that you die without a will. If the result is not what you expected, it may be time to speak to an estate planning attorney. Information contained in this article has been provided by Casey Gocel, Esq. of Mandelbaum Salsburg, 3 Becker Farm Road, Suite 105, Roseland, New Jersey. Casey can be reached at (973)736-4600 and is happy to answer any of your estate planning or tax questions.